Brandon Young is the new Highland County DARE officer. New Highland County DARE Officer Brandon Young said he has heard the rumors that the program does not work. He has a different view, believing no one will ever know how many students the program has helped. 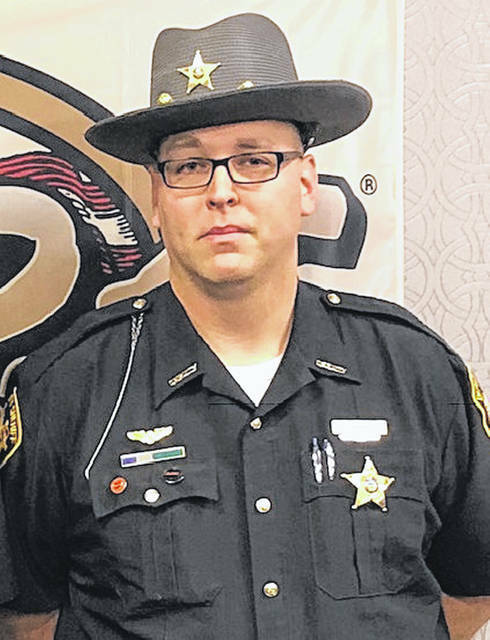 Young, who has been with the Highland County Sheriff’s Office since 2005, will pick up a program that was dropped when former DARE Officer Bobby Stroop retired in May of last year. Highland County Sheriff Donnie Barrera said his office has an agreement to start working with students in the Bright Local and Fairfield school districts this year, and he hopes the program grows from there. “The other school districts have resource officers at their schools, but Fairfield and Bright Local do not, so those are the ones we’re going to focus on for now,” Barrera said. The sheriff said he hopes to expand the program in the future. For now, Barrera said, Young will continue his current road duties four days a week, then will take one day a week to work with the DARE program. The sheriff said Young’s time working with DARE could expand in the future. Barrera said Young is glad the sheriff decided to bring the program back and that the deputy is anxious to get started. Young started working for the HCSO as a jailer in October 2005, transferred to the communications division in 2012 and was promoted to the road patrol division in 2016. Twenty-three officers from Ohio, Michigan and West Virginia attended the training, with many saying it was the hardest training they have encountered, but also indicating they felt it was well worth it, according to Barerra. Young’s training will allow him to work with K-4, elementary, middle and high school curriculums and enhancement lessons on topics including methamphetamine, inhalants, current drug trends, bullying and internet safety. Most DARE lesson plans are based on 10 weeks, with another two to three weeks of enhancement lessons, according to Barrera. The DARE Program is believed to be the most comprehensive drug prevention program in the world. It is taught to thousands of schools through America’s states and territories, as well as more than 50 other countries, reaching more than 1.5 million students, the news release said.